After six years of thinking about every word and every image, working and reworking every page of this inspiring story, our story has now available on Amazon. The video is of De’Ante opening the box of books from CreateSpace to see our book in print for the first time. 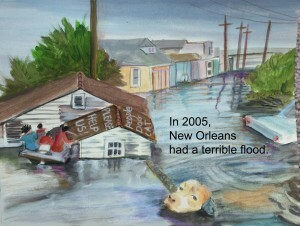 I repainted all the images, soaking thick watercolor paper in water, to honor the power of the flood waters, dipping the paper in brown acrylic paint to reflect the mud of the flood, and dipping the paper in blue acrylic paint to symbolize when the clear sky bounces off the water. We invite you to order a copy, or many copies, the week of August 14, 2017, to give Amazon a rush. And please write a review on Amazon. 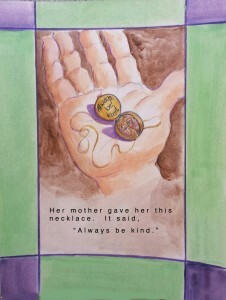 You can also help spread kindness by using the many ideas in our “Kids Kindness Korner” with your children, grand-children and students. Let us know what happens. Let’s flood our families, communities, country and world with kindness. As our planet gets warmer, it has the possibility of getting meaner. 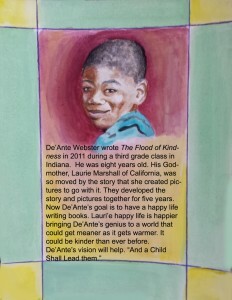 When 8 year-old De’Ante Webster of Indianapolis shared his magical tale called “The Flood of Kindness”, I recognized the importance of partnering his genius. 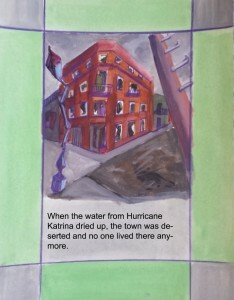 His story is about the powerful role that compassion plays in the aftermath of a large weather event – Hurricane Katrina. He wrote it in his third grade class for an historical fiction assignment. 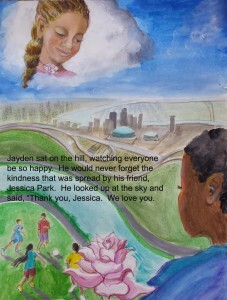 I offered to illustrate his story, which gives children the vision of the planet getting kinder as it gets warmer. 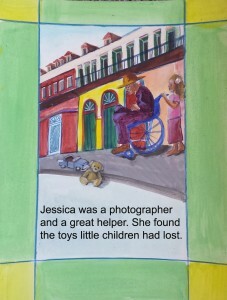 Because this is a child talking to other children, there is an added weight to the voice of the story. 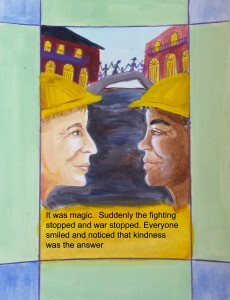 “The Flood of Kindness” has a positive job to do in the face of climate chaos. 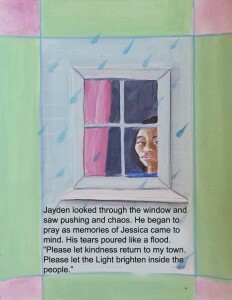 The story shows that something beautiful can grow out of the heartbreak surrounding natural disasters. 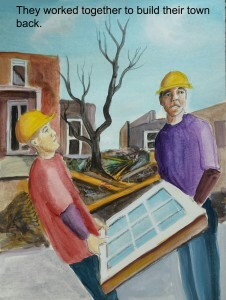 It will be helpful as the incidents of floods, hurricanes, tornadoes, fires and drought increase. This story is needed by our time. I submitted the story to a literary agent who said she did not fall in love with it, so she wasn’t going to pick it up. 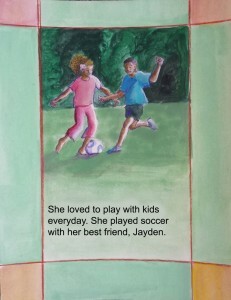 The illustrations paintings are rough drafts. They are works in progress, some more realistic than others, some with borders, others without. Your feedback would be much appreciated. What do you think works or doesn’t work? 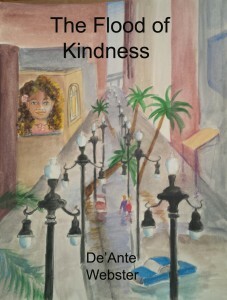 Our team (De’Ante, his mom, Ieshiea Webster, and myself) are also looking for an agent, a publisher or other insights about how to get “The Flood of Kindness” to the world. We’ve been working on it for five years and are ready to get input from a wider circle of our friends and colleagues. What I care about is how to get this story to the world, for the sake of the children’s future. Thank you ahead of time for taking the time to check this out. In the face of unprecedented challenges, there are tools we can give our young people as a vital source of protection – finding strength within and connecting to the world. 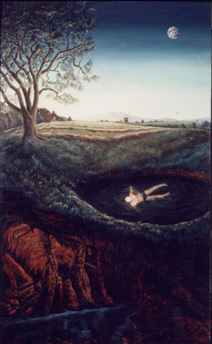 The purpose of the “Inner Landscape Project” is to give students an opportunity to explore their Inner Space in order to realize their unique imagination, their genius and their deepest values. The project affirms that each student matters, that their passions matter and the choices they make in creating a work of art matter. 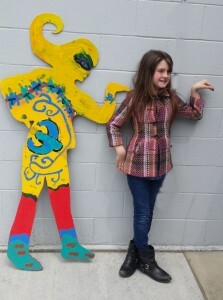 Seen together, the cut-outs are an explosion of joy and positivity. 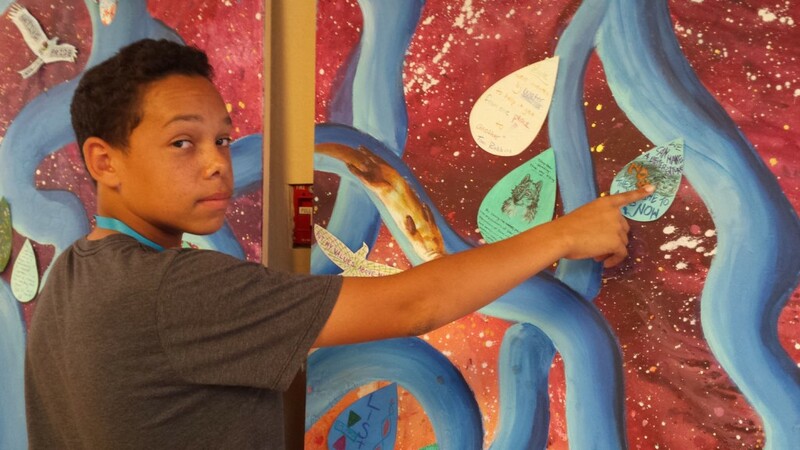 The student artwork adds to the welcoming school climate, as the students feel ownership, seeing their beauty reflected around the school. The Inner Landscapes below are at Hamilton Elementary School in Novato, California – a school that is 85% free and reduced lunch. 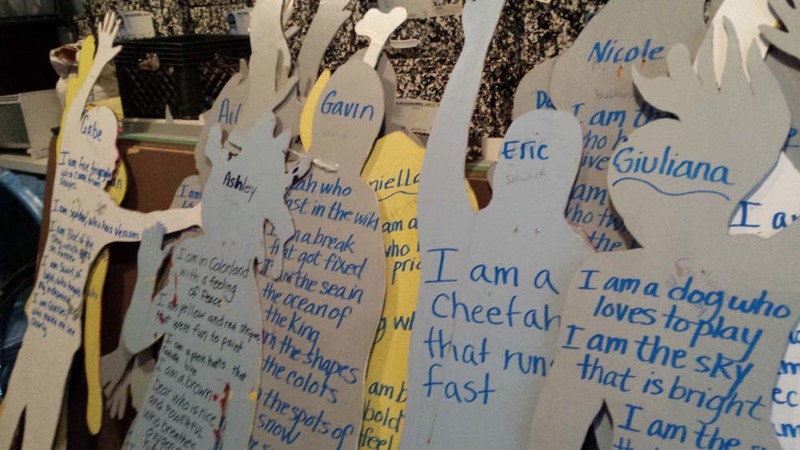 This arts integration project involves writing, mind-mapping, design thinking, drawing, painting, poetry and speaking. 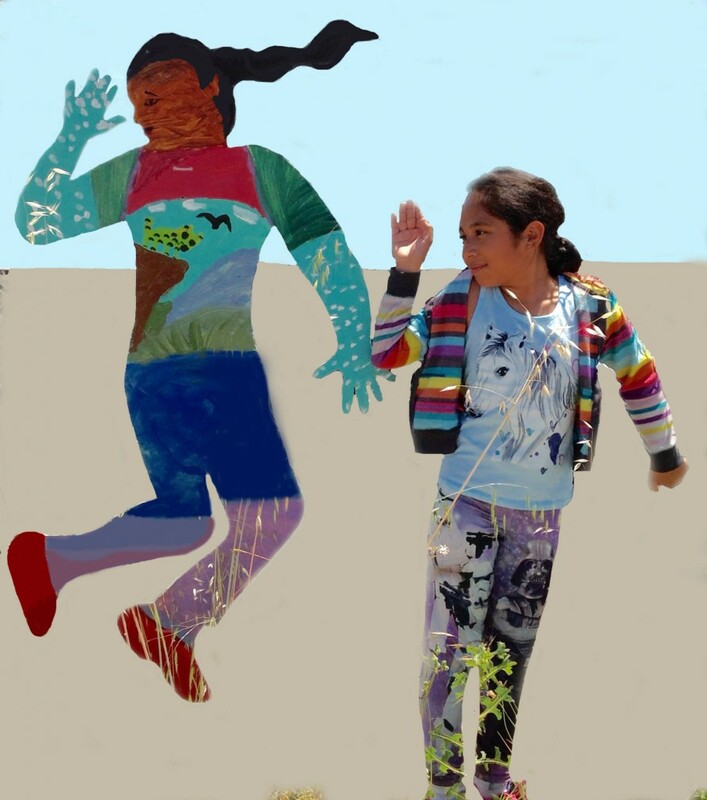 Through Create Peace Project, I co-facilitated the creation of 85 Inner Landscapes with Lili Lopez, funded by the Sausalito Arts Festival Foundation’s Artists Teaching Art. We consciously prepare young people for the 21st century by giving them the space to practice making decisions and taking action. After filling out a questionnaire, the students decided what pose to be in, what animal and plant to portray, what colors to use, how to incorporate the five simple shapes and what words reflect the symbolism of their artwork. Such a rigorous process resulted in a joyful experience where the students exert power and freedom. 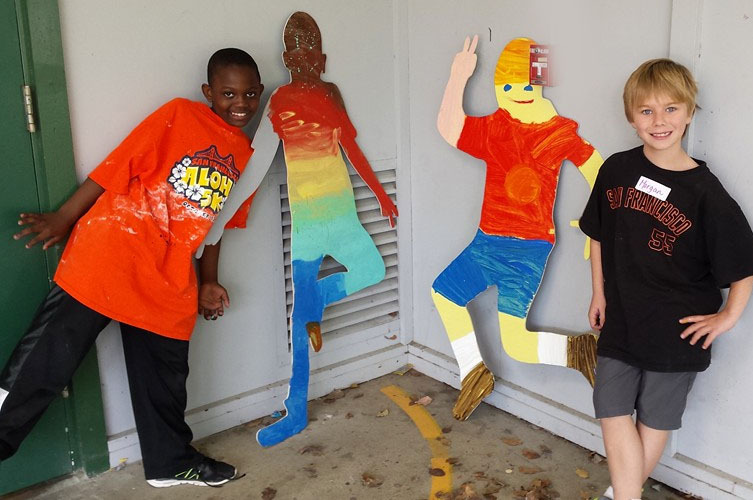 5th graders acted as mentors throughout the project which added to community bonding. The project also added to a greater sense of community as the students saw the beauty in the diversity of their Inner Landscapes. The next phase of the project is make a book with all the students Inner Landscapes and their “I Am” poems, so that every student can have a copy of their classes’ work. 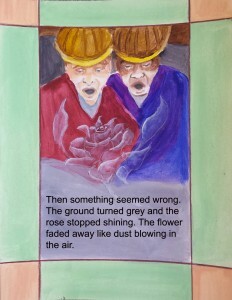 Here are two more of the paintings and poems. Let us partner the genius of youth to transform the world into a more playful and loving place. Dan Pink, one of my favorite thinkers, posted a short video today about the benefits of taking notes by hand instead of the computer. He said that, since you use more parts of your brain when you write and doodle than when you transcribe word-for-word into a machine, you remember better. Well, creatively taking notes is one of my favorite activities. I use the notes as the beginnings of more fully developed drawings. I share these images to fertilize your note-taking adventures. 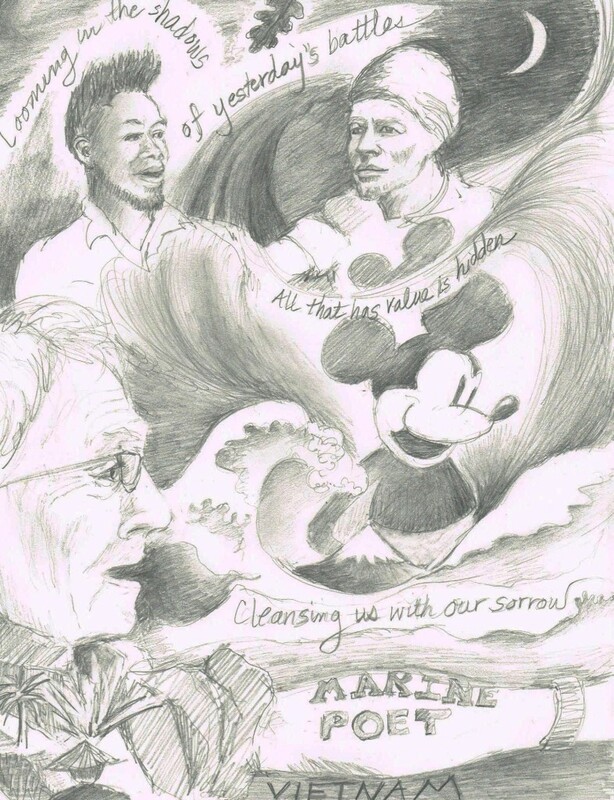 A Night at the Red Victorian Peace Center with poet Frank Walters and Bisi and the Moonwalker. 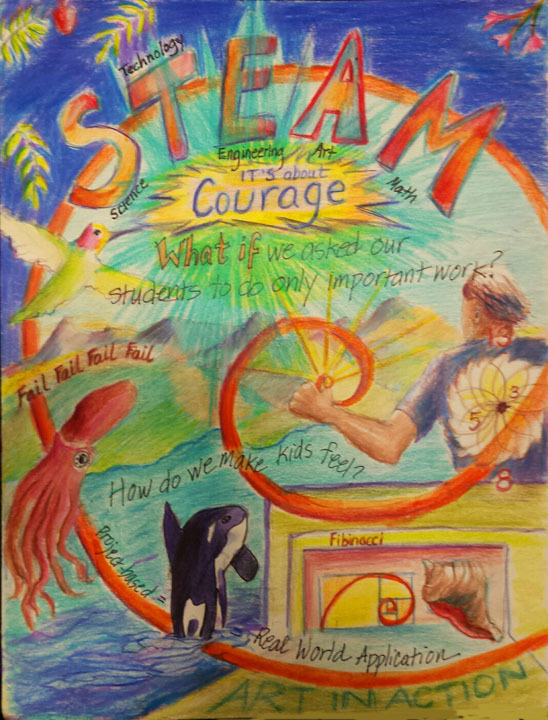 Contra Costa County’s STEAM conference, honoring the teacher of the year. 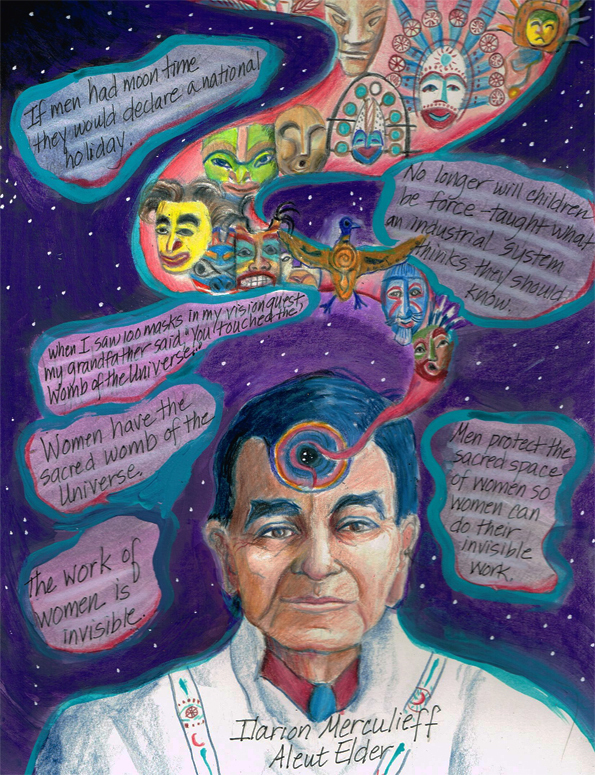 Illarian Merculief talk at Bioneers, 2014, San Rafael, CA. Marianna Cacciatore’s presentation on Love, Grief and Generosity at Big Ideas and Rich Conversations with Women, Sonoma, CA. 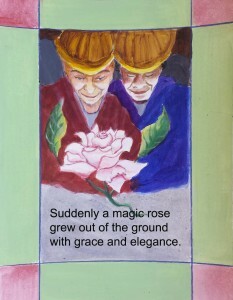 I let the words, ideas and images flow through me and onto the page, delighting in what shows up. I am reminded that the word “Human” means “Divine Hand”. 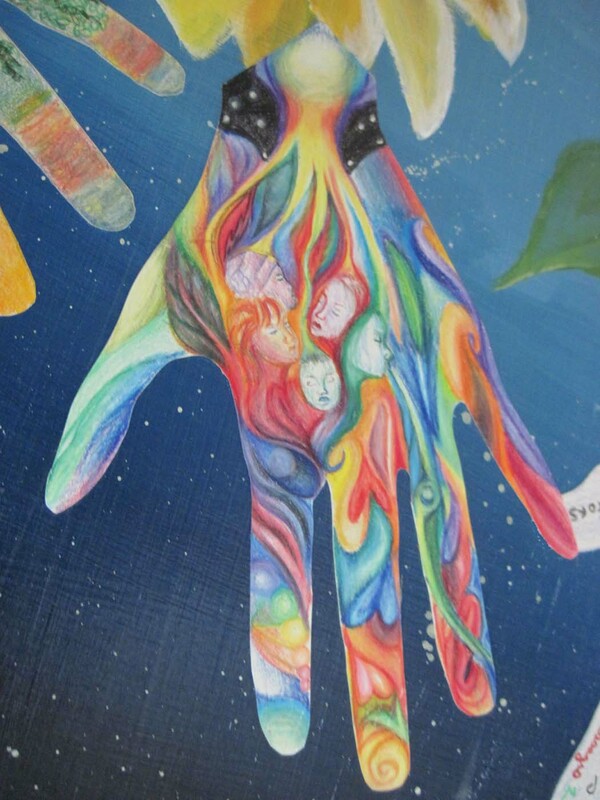 We can add humanity and divinity when we use our hands. I hope you have a blast taking notes. May the abundant miracle of Nature fill us with faith and generosity in 2016. The human race can work together like the leaves on a tree, each of us unique and needed. 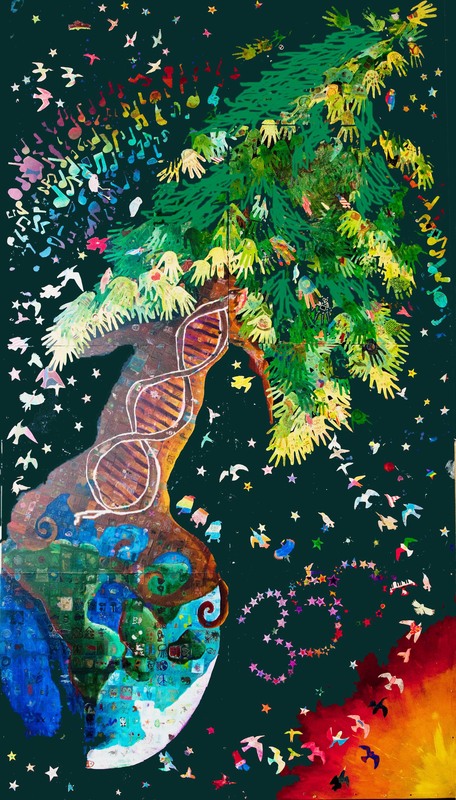 The Singing Tree Project demonstrates the great collective genius of empowered young people. See a review of the Forest of Singing Trees on this facebook link. How many times have any of us ignored our inner voice, only to regret it? The other day my 85 year-old father wanted a tomato out of the refrigerator. My instinct was to get up and get it for him, even though I had difficulty walking because of recent foot surgery. My father insisted on getting it himself. Still, a little voice nagged at me that I should get up and get the tomato. I didn’t listen. Sure enough, he fell as he tried to pull the vegetable drawer open. Fortunately, he wasn’t severely hurt, but I kicked myself for not paying attention to my intuition. I’m writing this article about an experience of a former student of mine to support taking those hunches with dead seriousness, every time. I’ve known a 19 year-old young man, whom I shall call Jake, since 1995 when he was in 4th grade. I taught him art, photography, and social studies from 6th grade through 10th grade in an arts-based, Waldorf-inspired school in Virginia. Jake is an exceptional young person on many fronts – as a naturalist, a leader and a photographer. His devoted and spiritually awake parents consistently built on his strengths. Their family were homesteaders of 180 acres of land where they have carved out a highly functional and beautiful living space consisting of a house, a studio/teaching area, a shop, a garage and a pool. Their driveway is one mile of steep dirt and rock. It feels like three miles to drive. Jake always was an acute observer of nature, sighting a species of northern fencepost lizard and a spotted turtle in 6th grade that had never been documented in the Virginia before. He is currently building a 20 x 16 foot house with a loft. This three-year project involved clearing the land for the building site as well as for a large, exceptionally productive organic garden. He is a serious photographer who assigned himself the task of keeping a visual diary this year comprised of taking a picture everyday. While still in high school, he shared his passion for nature by conducting annual summer camps for nursery and kindergarten students, taking responsibility for twelve young children in the woods from 9 to 3 everyday. He’s also ran his own camps for 7-12 year olds, as well as mounted overnight backpacking trips for teenagers. His experience in the wilderness has helped develop an acute sense of direction. He is a hard-working, original thinker who has already devoted his young life to strengthening the connection between human beings and nature. Fortunately, the process involves him being connected to himself and what his intuition tells him. In June of 2004, Jake drove his truck down his long driveway with his friend, known as Matt for this story, to set off for the Bonnaroo Music Festival in Tennessee. When Jake had driven three or four miles from home, he heard a voice saying “Take your boots with you.” Though he didn’t understand why he should bring his boots, he turned the truck around, drove back up and got his Gortex, rubber-soled, heavy-duty hiking boots. Then he and Matt drove 12 hours to the rock concert. Around 200,000 people were on a farm with big open fields. The Grateful Dead, Bob Dylan, Ween, and Tool were among those playing. The next day, Jake had a feeling there was going to be a major storm. He called his mom who looked on the weather channel and saw that a large storm system was predicted for the afternoon. Sure enough, there was a violent downpour. Before it began, Jake said to Matt, “I have a feeling that someone’s going to be hit by lightning. Let’s get in the truck.” So they watched the hail and lightning and sheets of water for about an hour. The rain clouds moved on and people were beginning to return to the soggy field, romping in the mud in their bare feet as the Grateful Dead resumed playing. Jake was about to get out of the truck when he heard a voice that said, “Put on your boots.” He listened and did just that. He and Matt started walking down to the large crowd of music lovers when an unexpected bolt of lightning swept horizontally across the sky and sent three prongs to the ground. Jake saw a white blaze. His arms flew up automatically to his chest. He felt as if his heart stopped and then experienced a burning sensation down his spine and into his feet. He sat down in a daze for twenty minutes, disoriented and in shock. His life flashed before his eyes as he sat. In this strange state, he was vaguely aware of flares going off and ambulances coming and going. Matt, who had seen the white flash and experienced ringing in his ears, helped Jake up. All of a sudden, Jake had such a massive surge of energy he thought he was okay. He felt supercharged, went down to listen to the Grateful Dead and stayed up all night. At 6:00 in the morning, he was feeling strange enough that he knew he better head for home. His excellent sense of direction was disturbed and he got lost numerous times. When he drove under power lines, he got severe headaches. Staying in a motel that night, his high energy level prevented him from sleeping again. When he got home, he told his parents he’d been hit by lightning. His left eye drooped. He had difficulty putting his thoughts together. His arm shook or jerked. He couldn’t write normally. He couldn’t operate a camera. His heart was experiencing irregularities After two more nights of not sleeping, he had six days of not being able to do much of anything but rest. He and his family figured out he was hit on the left side of his head because it was swollen and peeling and his curly hair stuck straight out. A doctor confirmed the heart irregularities with an EKG. Listening to the national news in Virginia upon his return from the music festival, Jake, his parents and Matt discovered why the ambulances had come while Jake was sitting dazed on the ground – the two other prongs of lightning from the bolt that hit Jake each struck another person. They both were killed. Neither had heavy-duty foot gear on. Jake’s boots broke the ability of the lightening to make contact with the ground. Jake is alive because of his vigilance in paying attention to his intuition. 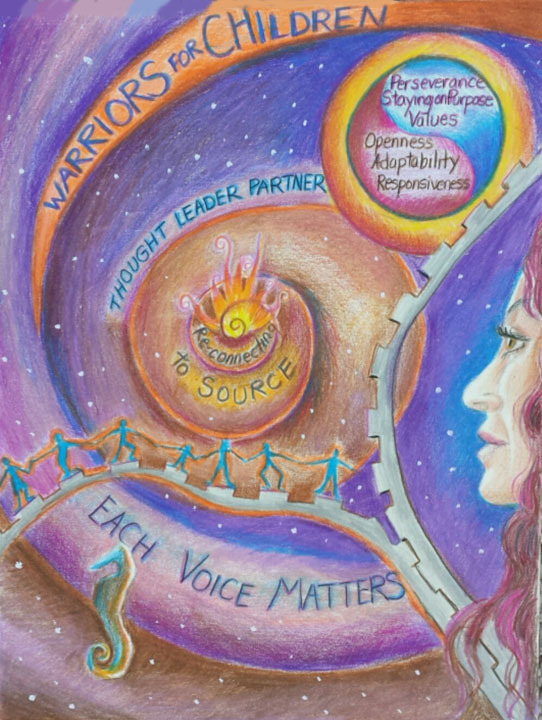 Taking positive action on the messages from his inner voice saved his life. I share this story in hopes that we all can be strengthened in our alertness and faith in the internal guidance that spontaneously and mysteriously arises. If we maintain our watchfulness often enough and long enough, and ACT ON THE MESSAGES WE RECEIVE, there’s a very good chance we’ll end up leading a life with few very regrets. 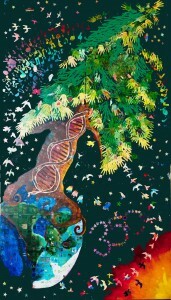 It is with this thinking in mind that the Singing Tree Project invites the whole world to create together, led by youth. The most recent collaboration, the Water Willow Singing Tree. 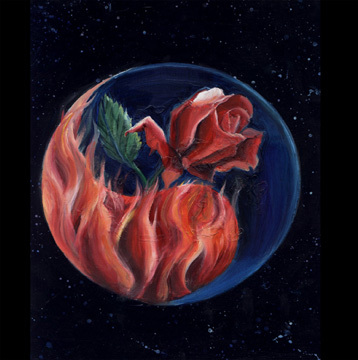 was designed and prepared by students at Marin School of the Arts, in Novato, CA. 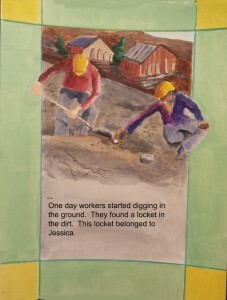 Artists Teaching Art, a program of the Sausalito Arts Festival Foundation, funded my residency to facilitate the mural. 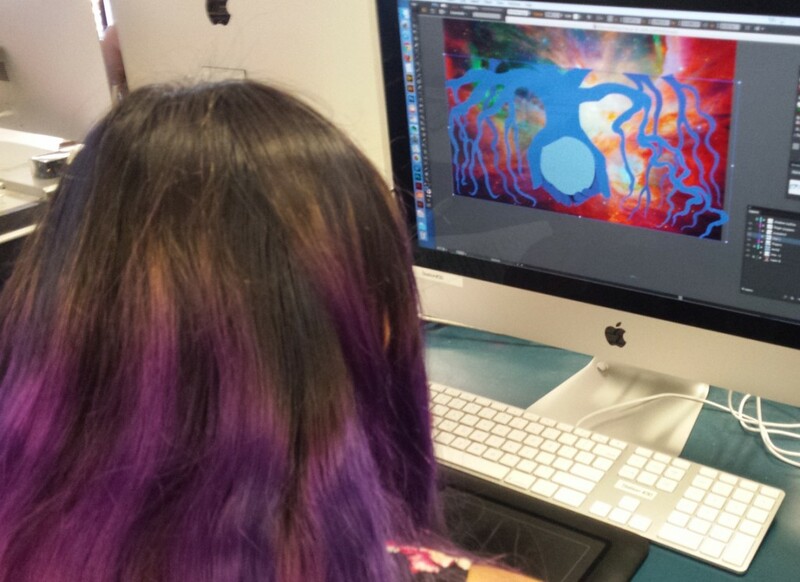 Ten Digital Design students came up with studies of a tree on the earth in space, incorporating the theme of water. Here’s Shannon Boorman’s (aged 16) brilliant digital design. I put the different designs into a unified whole. 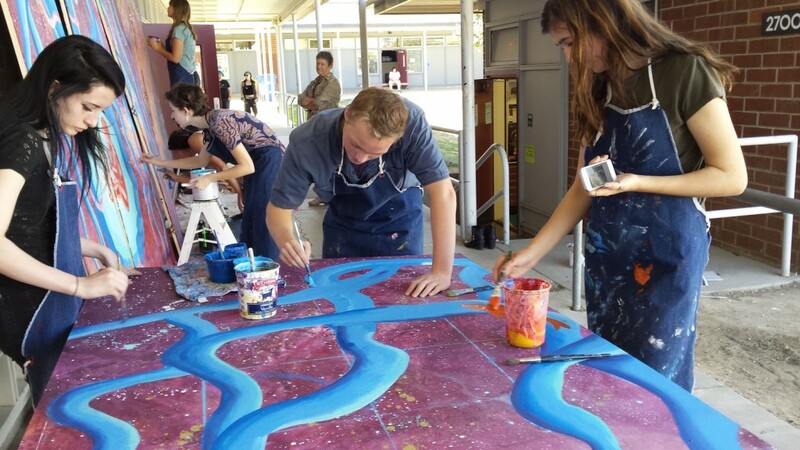 Painting students created the 8′ x 16′ background. The Product Design class built the mural’s structure and laser cut the leaves and birds. The experience of collaboration across departments was exciting. Here are some of the 35 painting students who added their mark to mural. 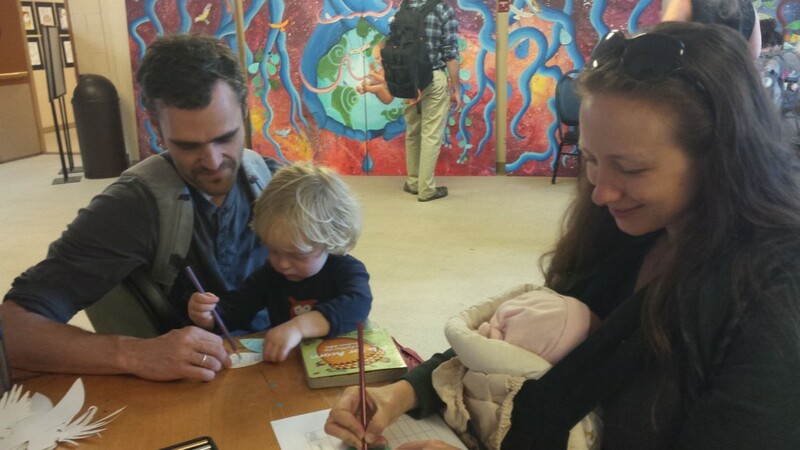 People at the Bioneers Conference completed the mural by adding their wish for water on the leaves and birds. Ten students attended the Conference free of charge. 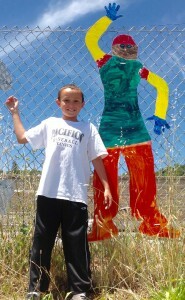 The Marin School of the Art’s students finished the mural by gluing the pieces on back at their school. Here’s some feedback from the students about the project. Beating the odds of climate chaos may unleash an unprecedented level of joyous invention and cooperation. Just look at what is possible when we work together. This is what democracy looks like. This is what Peace looks like. It is with heavy heart that I learned this week that one of my students from Helen S. Faison in Pittsburgh, PA, has been arrested for the murder of one of my other students. Two young lives lost. Two young men failed by our lack of village, the criminalized drug structure which fuels the underground market economy and doesn’t address addiction, the prison system without rehabilitation, the easy access to and glamorization of guns. I’ve sent you a book written by a friend of mine who lost his 20 year-old son to a 14 year-old’s gun. The book is called From Murder to Forgiveness by Azim Khamisa. I am thinking of you in this difficult time. I imagine you are in a state of post-traumatic stress disorder: from the loss of your friend at your own hand, from the loss of your freedom. I can’t imagine what you are going through. No matter what our legal system says, you are not a criminal. You are someone in a spiritual crisis. 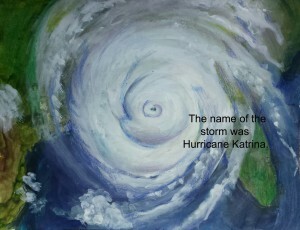 I’m enclosing a copy of the painting I made of you 9 years ago with your words written below. You wrote “Being an angel is God calling me.” The streets shouted at you: This is the only way! The thug life style is strengthened in the hostile environment of prisoners and guards. The challenge to hear God’s call will be very hard. From art class when you were in 5th grade, I remember your intelligence, your artistic talent, how easily your feelings were hurt, your love of sports and daring. This insanely traumatic moment in your life can open a window to taking a different path for your soul. The 14 year-old who killed Azim’s son was tried as an adult. With spiritual work every day for 5 years, Azim forgave the young man. The young man has forgiven himself and will work with my friend when he gets out of prison with the Tariq Khamisa Foundation. The two will train young people in making non-violent choices. It’s hard. Most people think it’s impossible. Everyday, Azim does a good deed in his son’s name. He was not a great father, not very present in his son’s life. Now, he does what he can to stop young people from hurting each other. 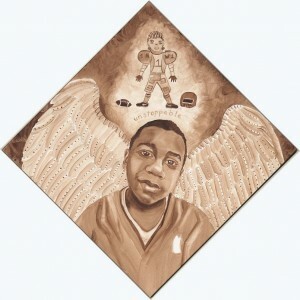 My heart breaks for Garrick, for you and for all who love you both, which includes me. 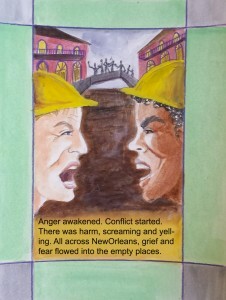 The card I am sending you was made by a student in California who was incarcerated. She let God’s call flow out of her onto the paper. I pray you have moments of safety to listen to that call within you. This is very hard. How do these odds get beaten? 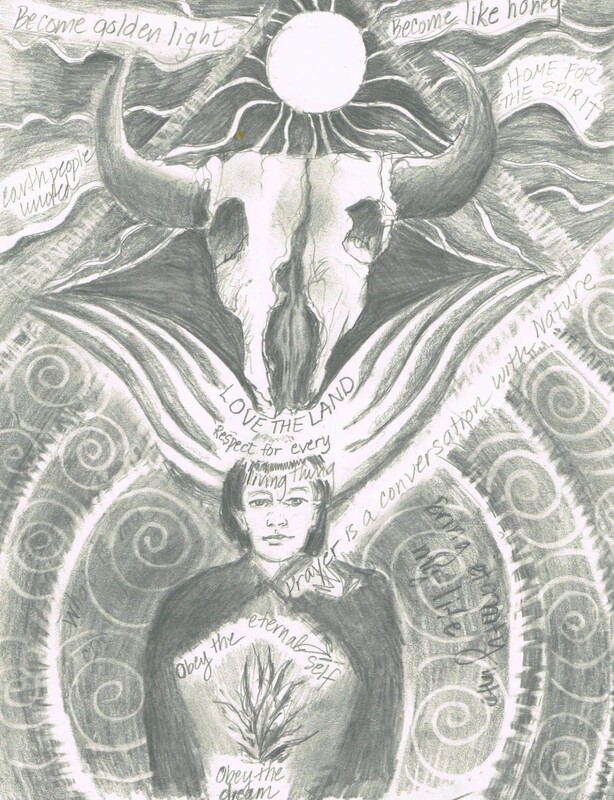 This is a collaborative drawing made by two high school Safe School Ambassadors and myself in Temple, Texas. For the last year, I’ve been a trainer for an amazing non-profit called Community Matters. 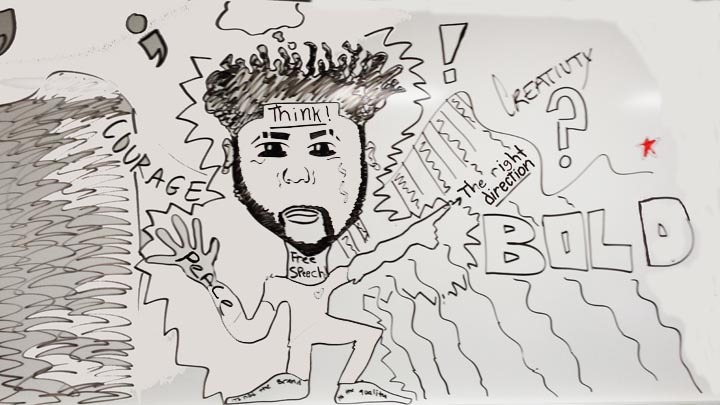 Founded in 1996 by visionary educator Rick Philips, this organization makes COMMUNITY MATTER, crafting an evidence-based Safe School Ambassador Program that empowers elementary, middle and high school students to recognize mistreatment and transform it. I’ve travelled to Minnesota, North Dakota, Illinois, Texas, South Carolina and throughout California to deliver a two-day training to students who are chosen by their peers as leaders. The teachers, who also participate in the training, meet with the students on a regular basis throughout the school year to support the real-life application of peace-making skills. I am honored to be a part of such an intelligent approach, which helps the students understand that the longing for belonging is the key to stopping exclusion and having the courage to stand up for justice. I couldn’t believe the honesty and respect that we had for each other. Just coming together and learning and becoming a group that is strong is what I loved. I appreciated the togetherness with people that I typically would not get to know on a deep level. I learned that I’m not alone and everyone has problems like me. That the person who is getting hurt will hurt. The program shows us that we aren’t alone and how much of a difference we can make in our school. It made us more aware of the internal battles our peers fight every day. I learned to put up a putdown. In order to help, you must first notice. I learned how to be a ninja to stop mistreatment. How to accept people for who they are and treat them how I wanna be treated. The most important thing I got was how to stand up to an aggressor without being an aggressor. This program has helped me a lot to be strong and ignore the people who bring me down. Thank you. I hope this program thrives. I met new people I probably wouldn’t have if it weren’t for this program. I really love this training to be an ambassador. I’m so filled with knowledge and tools – I’m ready to take it to the world. I wish everyone could do this program and show how they can use their skills positively. I’ve changed in just two days. When was the last time you heard students so deeply engaged in their learning? Empowering youth with emotional intelligence and impact is how we will beat the odds. On Jan. 7, 2014, I gave a talk at Marin School of the Arts called “Art is Rewiring the Human Race.” I asked the photography, film, and painting high school students to write questions throughout my talk to support further exploration of the topic – The practice of art as a tool to help human evolution grow from seeing “Differences as Dangerous” to “Differences as Opportunity.” I was moved by the students questions, which stimulated deep thought as I wrote responses. We watched two of my videos, A Call to End War and The Redwood Singing Tree of Biodiversity, which some of their questions refer to. 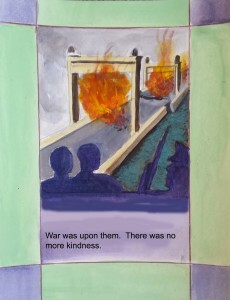 Why did you think of making the video “A Call for the End of War”? There was a contest by the Pachamama Alliance called “Positive Futures.” When I saw the Urban Apache Crew dancing in San Rafael, I filmed them because they were so inspiring. Reviewing the footage, I knew the dancers were modeling the kind of positive future I want – the opposite of war. The video unfolded from there. Why do you say a prayer just for sons in the End of War video? Most wars are planned and fought by male soldiers. This includes the drug wars in our country. Much of the aggression on our planet is carried out by men. It is masculinity that is serving itself, instead of the women, children and life. The latter is what I call “Sacred Masculinity.” I am aware that women and children are the victims of war. I absolutely agree that women and LGTB people are part of the new wiring. In fact, many are leading the way. “Divine Femininity” and “Sacred Masculinity” are needed on our planet to balance the huge amount of aggression that is going on. 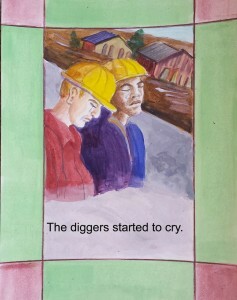 Is this a realistic goal – to make a world that is based on respect and cooperation instead of greed and manipulation? 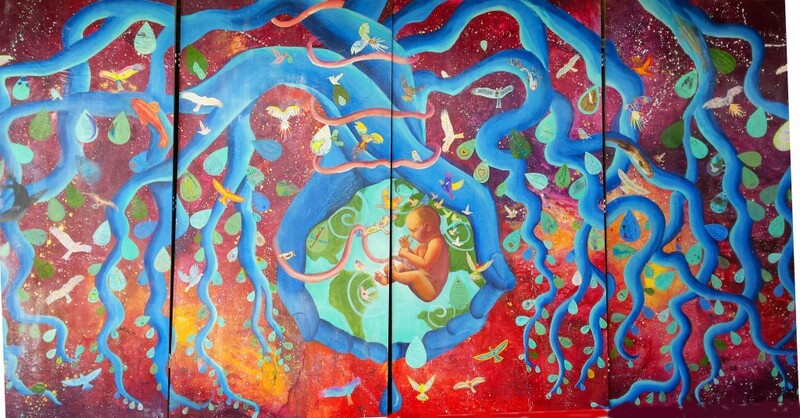 When I make collaborative murals, I see the joy and cooperation that is possible. Over and over, I witness groups of people creating something more powerful than they could by themselves. I see people working out their conflicts with respect. As former Army Captain, Paul Chappell, points out in his book “The End of War,” people thought it was unrealistic for slavery to be abolished or for women to vote. These things changed. I probably won’t see a world that works for all in my lifetime, but every cell of my body is committed to helping create a safe world for “all of the children of all the species for all of time.” That’s the standard biomimicry architect William McDonough has set. Pretty high, huh? I believe it is worth working for. Making one painting is good, but does it actually influence change? No, on-going social contact influences change. Making a painting is one step among many that are needed. Where do imagination and improvisation relate and have similarity? They are intertwined. Imagination is the flow of vision and ideas. Improvisation is the act of bringing ideas into physical form. Our country had the vision of “Liberty and Justice for All.” We’ve been improvising ever since. We have a vast expanse of land with many nationalities creating together. As a painter, when I bring my ideas into physical form and put paint to canvas, the painting starts feeding me new ideas. Reality is always feeding imagination, which, in turns, gives new forms to reality. More and more people are talking about a world that works for all. 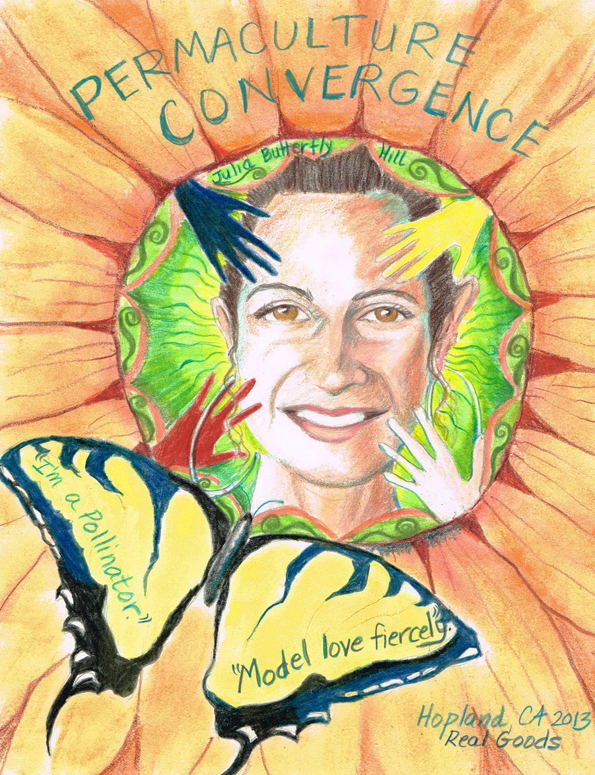 Novato High School, where the culture is one of acceptance and appreciation, reflects that. You will take that out into the work world, and into the amazing unknown future that will demand imagination and improvisation. How do all these kids cooperate, collaborate and brainstorm together as one? It is good to think this way (ending war, unity through creativity), but is it realistic? How is change actually made? People are too optimistic. Change is mysterious and big. One way it begins is by having a vision that a different possibility exists. ”Without vision, the people perish.” Again, I ask you to think about when slavery was legal in this country. No one thought it could change. You were arrested or killed for trying to change it. People self-organized to free slaves, to tell the story that all people are created equal on a new level (not just white men), to fight to change laws. Harriet Tubman saw each of the people she helped to escape as free souls already. 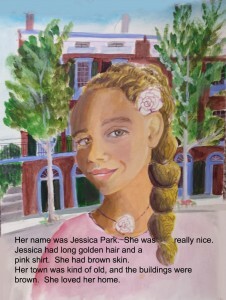 She never lost a single person in the Underground Railroad. Change happened from the ground up, like a tree growing. The problems of our times seem overwhelming and huge, like a blue whale that takes 10 miles to turn 180 degrees. Think of our messy, heart-breaking, gridlocked situation like a school of sardines, which is as big as a blue whale. When 8% of the school starts to go in a different direction, the whole school follows. (Metaphor from Clayton Mueller of the Cree Nation). If we keep working on our own problems, increasing our mastery, autonomy, and higher purpose; and connect with others who are doing the same, something powerful will happen. On the issue of optimism, I hold the vision of a world that works for all people and all species with great conviction. I doubt if it will happen in my lifetime. My conviction is not dependent on the outcome. Frederick Douglass said in 1888 “Do not be overwhelmed by the magnitude of the problem, nor the power of the opposition,” in regard to women’s suffrage. He did not see women get the right to vote in his lifetime. This did not disway his efforts. In 1913, when women could finally vote in our nation, his devotion to the vision of “Liberty and Justice for All” was finally fruitful. In other words, we don’t know when change will actually happens. We know what we are committed to and work for that. How can we spread this message? First, by living it. Honoring our gifts. Developing our talents. Looking for the gifts of others, instead of focusing on their flaws. Bravely learning from our differences, so we become wiser and deeper. Not taking anything for granted, especially the people and planet that give us life. Second, using our creativity to spread the message in all we do. Photograph it. Speak it. Dance it. Perform it. Video it. Paint it. Sing it. Write it. Research it. Measure it. Evaluate it. Share it. 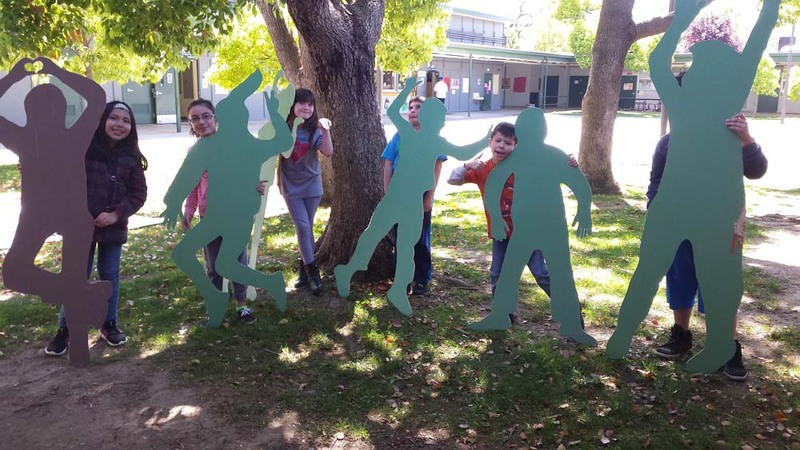 Get together with our friends and figure out how to distribute the message. I’m here to help as well, as are your teachers. How do we make opportunities like this available to more people? By first listening to what people are concerned about and coming up with driving questions to create around. How can we make a high school where everyone loves learning and knows they are important? How can we make a town where everyone loves their work? 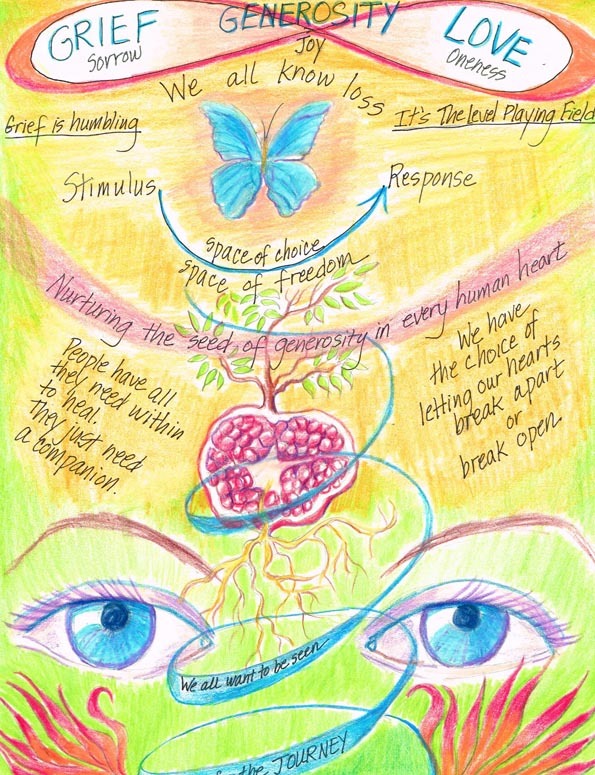 How can we be free from addiction? How can we maximize the use and sharing of scarce water? Then we envision projects and invite people to join. 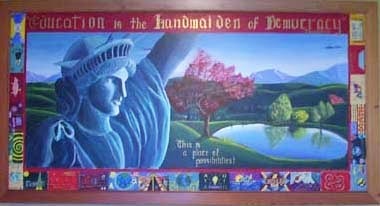 We can make a school wide mural. 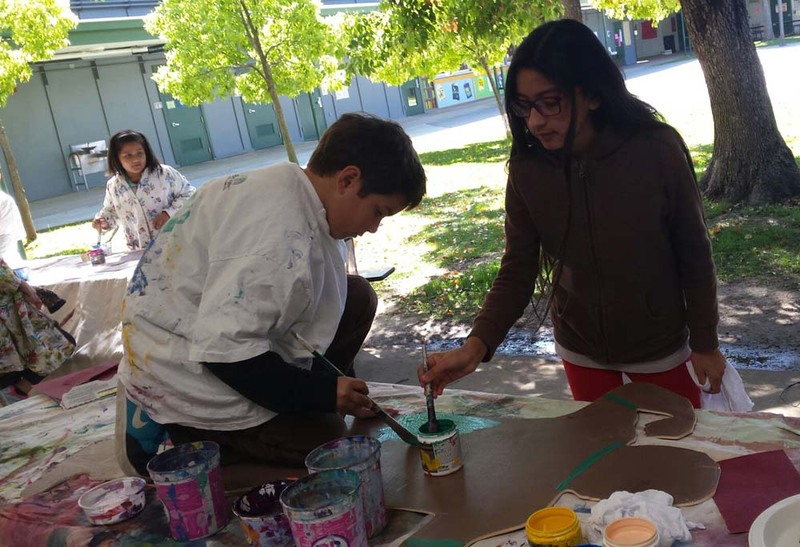 We can make an intergenerational mural with NHS students and the people in Novato’s Nursing homes or with the grandparents of the students in Novato High. 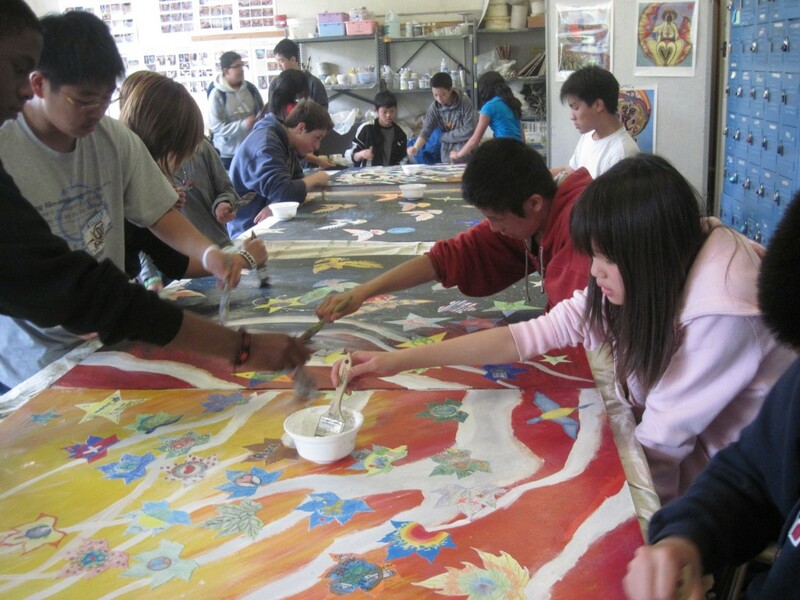 We can make a mural with students in another country. 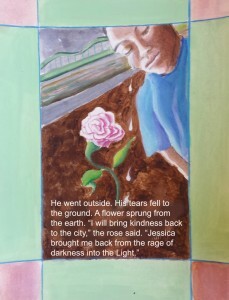 We can make collaborative plays and musicals in front of the mural that tells the stories unlocked by the mural creation. Our imagination is the limit…..
How do I start to make these changes? What do I do to help? You have already started by asking these questions. I’ll also repeat what I said in my talk. Seek your own spark and the spark in everyone you meet. Put those sparks together and make a big, beautiful light in the darkness of fear and hatred. Know that we are here together on a rare and precious planet that has life, while there is no life around us for billions of miles. Our differences are here to learn from and to bring us joy. Thank you for asking such important questions. 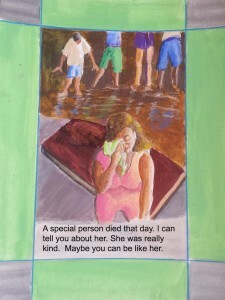 The outcome of Laurie’s Teacher Training workshop is that my students are more engaged in lessons. 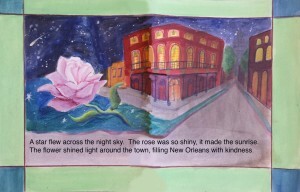 She shows how to use stories, beautifully woven with color and “fire” throughout the lesson, connecting beginning to end. She has a wealth of knowledge about educational resources and knowledge. She is kind, inspirational and wise.